1. Republic Act No. 10157 also known as the Kindergarten Education Act provides equal opportunities for all children to accessible and mandatory kindergarten education. Thus, the Department of Education (DepEd) issues the enclosed Omnibus Policy on Kindergarten Education for School Year 2016-2017, and the subsequent school years thereafter. 2. This DepEd Order (DO) therefore sets the basic standards for an efficient and effective Kindergarten Education Program implementation for both public and private schools nationwide, and shall serve as basis for accreditation and/or recognition of those intending to put early learning centers. f. monitoring and evaluation for the standard delivery of kindergarten services. 4. All existing Orders, Memoranda, and other related issuances inconsistent with this policy are superseded. 5. This policy will remain in force and in effect, unless sooner, repealed, amended or rescinded. 1. Pursuant to the “Kindergarten Education Act” (Republic Act No. 10157) and the “Enhanced Basic Education Act of 2013” (Republic Act No. 10533), mandatory and compulsory Kindergarten education that effectively promotes physical, social, cognitive, and emotional skills stimulation and values formation is offered to all five (5)-year old Filipino children to sufficiently prepare them for Grade One. The Kindergarten Education Act recognizes that Kindergarten education is vital to the development of the Filipino child “for it is the period when the young mind’s absorptive capacity is at its sharpest” (Section 2, RA 10157). It is also the policy of the State to make education responsive to the needs, circumstances, and diversity of learners, schools, and communities using developmentally-appropriate and culturally-sensitive practices. 2. In recent decades, numerous studies have shown that early childhood education is key to success in later school and in life. According to Reynolds (2000), longterm effects include a reduction in remediation and assignment to special education, an increase in high school graduation rates, higher rates of employment and lower instances of crime. Furthermore, children who participate in quality early childhood education “perform better in school, and become productive members of the community and society” (UNICEF, Philippines). 3. The advent of RA 10157 and RA 10533 is a major milestone that gives the Department of Education (DepEd) the official mandate to offer Kindergarten education to all five-year old children. This comprehensive policy ensures a standardized implementation of the Kindergarten Education Program. It entails a thorough review and analysis of the different issuances relative to Kindergarten by different stakeholders with the objective of coming up with a single policy. 4. Consistent with Section 2 of the Implementing Rules and Regulations (IRR) of RA 10157, the Department of Education shall provide equal opportunities for all children at least five (5) years old with Kindergarten education. This DepEd Order therefore sets the basic standards for an efficient and effective Kindergarten Education Program implementation for both public and private schools nationwide, and shall serve as basis for accreditation and/or recognition of those intending to put up early learning centers. 5. This DepEd Order further provides a comprehensive Kindergarten Education policy covering the different components of implementing Kindergarten Education Program— curriculum, instruction (i.e., teaching methodologies and strategies), assessment, learning resources and instructional materials, learning space and environment, and monitoring and evaluation for the standard delivery of Kindergarten services. A. Kindergarten Education (KE) is the first stage of compulsory and mandatory formal education which consists of one (1) year of preparatory education for children at least five (5) years old as prerequisite for Grade One (Section 6, IRR of RA 10533). B. Kindergarten Catch-Up Education Program (KCEP) refers to the various educational delivery modes and interventions for children above five (5) years who are caught in difficult circumstances and/or extreme poverty that they missed schooling, attending Day Care Service, or any kind of early childhood learning opportunity. C. Kindergarten Curriculum Guide (KCG) is also known as the Standards and Competencies for Five (5) Year Old Filipino Children. It is the listing of competencies or skills in the seven (7) developmental domains for holistic development of children. The KCG is the basis in coming up with the daily activities spelled out in the Teacher’s Guide. D. Teacher’s Guide formerly known as the National Kindergarten Curriculum Guide, or the Forty (40)-Week Curriculum is the primary reference of Kindergarten teachers in carrying out the day to day teaching and learning processes. It contains suggested play- and theme-based activities for the different blocks of time per day, within a week and in the span of forty (40) weeks. 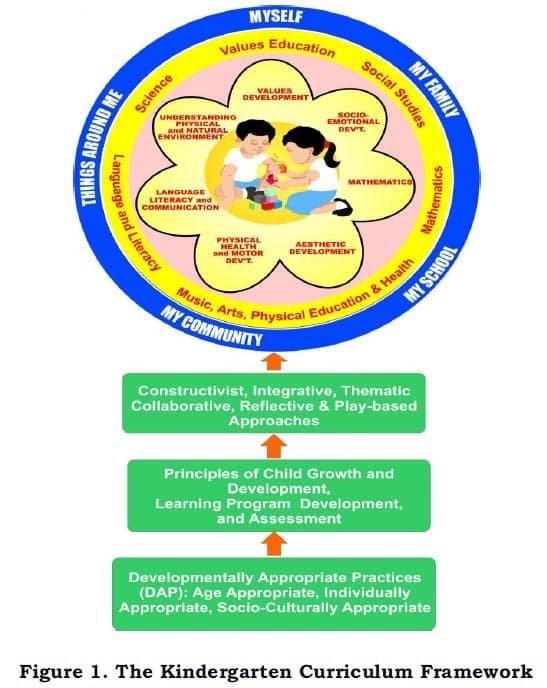 E. Developmental Domains refer to the seven (7) learning areas in the Kindergarten curriculum namely: 1) Language, Literacy, and Communication (Wika, Karunungan sa Pagbasa at Pagsulat); 2) Socio-Emotional Development (Pagpapaunlad ng Sosyo-Emosyunal at Kakayahang Makipamuhay); 3) Values Development (Kagandahang Asal); 4) Physical Health and Motor Development (Kalusugang Pisikal at Pagpapaunlad sa Kakayahang Motor); 5) Aesthetic/Creative Development (Sining); 6) Mathematics (Matematika,), and; 7) Understanding of the Physical and Natural Environment (Pag-unawa sa Pisikal at Natural na Kapaligiran). F. Developmentally Appropriate Practice (DAP) is an approach to teaching based on child development and early childhood education research. It is the application of knowledge and skills to suit the age, individuality, and the social and cultural backgrounds of each learner. This practice allows teachers to modify their teaching strategies to respond to diverse learner needs. G. Medium of Teaching and Learning (MOTL) refers to the Language of Instruction (LOI) or Medium of Instruction (MOI) where Mother Tongue of the learners shall be the primary language used in teaching and learning in Kindergarten. H. Mother Tongue refers to the “language or languages first learned by a child, which he or she identifies with, is identified as a native language user of by others, which he or she knows best, or uses most.” (Section 4(d), Implementing Rules and Regulations of RA 10533). A. The Kindergarten Education (KE) Program aims that all five year old children achieve the standards and competencies expected of them, taking into account their diverse backgrounds, prior knowledge and experiences, skills, attitudes, personal traits, and interests. Achievement of universal Kindergarten or provision of KE to all will increase young learners’ chance of completing formal schooling, reduce incidence of school leavers, and ensure better school performance. B. Concomitant to the goal of the Kindergarten Education Program is the promotion, protection and maintenance of the health and nutritional status of children. This is ensured through provision of appropriate health and nutrition assessments and various health services, as well as inculcation of desirable habits and behavior to enhance motivation and capacity for learning, prevent absenteeism, and guarantee that children enjoy and stay in school. a. Every child is unique. Growth and development vary from child to child, for whom the first eight years of life are most vital. S/he has an innate desire to learn, and this is best done through meaningful and real experiences. b. Every aspect of growth and development is interrelated and interdependent. The child needs to be nurtured in a good and caring environment that enhances healthy and dependable relationships with other children and most significant adults. c. The learning and development of every child involve a series of complex and dynamic processes that are best attended to in a more positive and responsive manner. d. The child must be encouraged to aspire beyond one’s own level of achievements and to practice newly acquired competencies. e. Every child is a thinking, moving, feeling, and interactive human being able to actively participate in the learning and development of self in the context of one’s family and community, including cultural and religious beliefs. a. The learning program is child-centered. It promotes the holistic way by which young children grow and develop, and recognizes the role of families and communities in supporting the child through various stages of growth and development. b. The learning program is appropriate for developing the domains, and must sustain interest in active learning of all young children including those with special abilities, in marginalized situations, and/or those at risk. c. The learning program is implemented by way of diverse learning activities that may be enhanced with multimedia technologies such as interactive radio, audio and/or video content, and information and communications technology-enhanced activities. d. The use of learning materials and other resources that are locally developed and/or locally available is encouraged. The mother tongue shall be used as the child’s language of learning. a. Assessment is done to monitor learning, know where the child is at, and inform parents of the child’s progress. b. Assessment is crucial to identifying the child’s total developmental needs and does not determine academic achievement. c. Assessment is best conducted on a regular basis so that a timely response or intervention can be made to improve learning. d. The results of the learning assessment of a child shall be kept strictly confidential. Ratings should be more qualitative or descriptive, and less numerical. e. The family and community must be informed of the general outcomes of learning so as to encourage further cooperation and partnerships. A. The Kindergarten Education program must be engaging, creative, child-centered, and follow developmentally appropriate practices which immerse the learners in meaningful experiences. Learners are given equal opportunities to effectively promote their physical, social, cultural, emotional, and intellectual development, including values formation to ascertain school readiness. B. Children learn best through play and active involvement in concrete and meaningful experiences. Play is essential to healthy and holistic child development as it gives children opportunities to learn about and understand their world and practice newly acquired skills. Play is also essential in building children’s self-confidence, problem-solving, and cooperative learning skills that prepare them for lifelong learning. The varied play-based activities in Kindergarten lead the learners to becoming emergent literates, and help them to acquire naturally the competencies to develop holistically. This also leads them to become willing risk takers, and ready to tackle formal school work. C. Children continuously develop in all domains in a holistic way. When progress is noted in one developmental domain, it will consequently impact on other domains. The contents of the developmental domain are defined by learning expectations. D. The Mother Tongue of the learner shall be the primary medium of teaching and learning in Kindergarten (Section 5, RA 10157). A. The Kindergarten curriculum has been crafted using the thematic or integrative approach to curriculum development in a spiralling learning process. This approach employs integrative and interactive teaching-learning strategies as well as child-centered learning experiences. A copy of the Kindergarten Curriculum Guide can be accessed via the DepEd website: http://www.deped.gov.ph/k-to-12/ curriculum-guides. B. Figure I illustrates the Kindergarten Curriculum Framework. The items in rectangles show the theoretical bases for teaching-learning in the early years, which are founded on constructivism, integrative, thematic, collaborative, inquiry-based, and reflective teaching in play-based approaches with application of the Developmentally Appropriate Practices (DAP); these support the principles of child growth and development, and the learning program development and assessment. The circles, on the other hand, signify the system of how Kindergarten Education is to be employed. The interlocked ellipses represent the learning domains that have to be nurtured and equally imparted to holistically develop children. It also forms a flower that portrays the gradual unfolding but steady development, as is expected of every child. The child is seen as being in the process of blossoming – like a flower bud whose development should not be forced lest it lose its chance to fully mature. The domains are enclosed by the Learning Areas children will meet in Grade One onward, for which they are being prepared. The outermost layer indicates the Curricular Themes upon which the Teacher’s Guide is designed. C. Kindergarten Education is contextualized to address the specific circumstances of diverse learners with the curriculum enhanced in relation to their context. i. Kindergarten Madrasah Curriculum (KMC) is also based on the KCG and patterned after the way the Teachers’ Guide is designed. The only difference is the integration of Arabic Language and Islamic Values Education (ALIVE) concepts. This curriculum is for Muslim Kindergarten learners enrolled in elementary schools with ALIVE classes. ii. For schools in indigenous communities or with a dominant number of indigenous learners, guidance in contextualizing the Kindergarten Curriculum Guide is provided for in the Indigenous Peoples Education (IPEd) Curriculum Framework (DepEd Order No. 32, s. 2015). Indigenous Peoples Education Curriculum is “identified broadly in the National IPEd Policy Framework as appropriate basic education pedagogy, content, and assessment through integration of Indigenous Knowledge, System, and Practices (IKSPs) in all learning areas and processes. It also covers the provision of adequate and culturally-appropriate learning resources and environment” (DepEd Order No. 32, s. 2015). iii. Kindergarten Catch-Up Education Program (KCEP) Curriculum is designed for learners who have not undergone Kindergarten Education due to difficult circumstances. They include but are not limited to children who are displaced because of armed conflict, urban resettlement, and disasters, with chronic illness, and victims of abuse and child labor practices. The KCEP curriculum is a two (2) month play-based program adopted from the Teacher’s Guide. A. Mother Tongue is the primary MOTL in Kindergarten. B. Learning activities are organized into thematic units or teaching themes. Thematic units integrate concepts and skills from the seven (7) developmental domains. The themes include – Myself, My Family, My School, My Community, and Other Things Around Me. 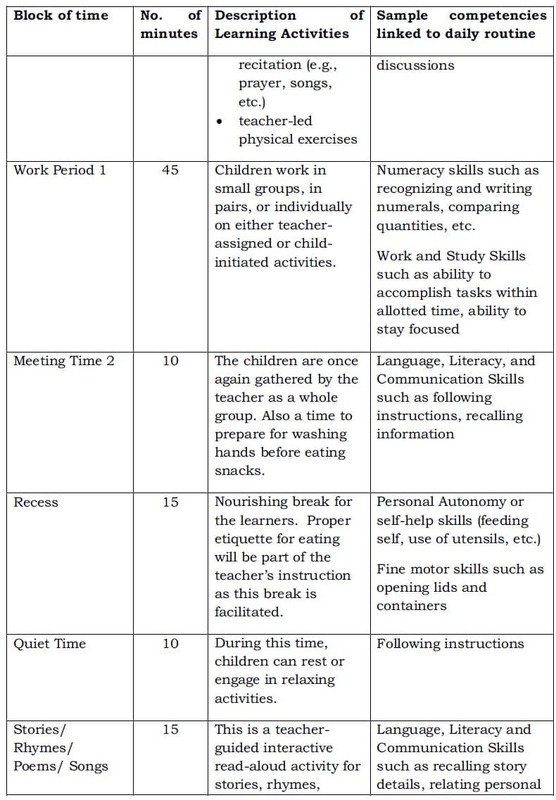 C. Kindergarten follows a class program known as the Blocks of Time (See Table 1). Following the daily routine helps children feel safe while supporting and encouraging them to take risks and work cooperatively with others. The Kindergarten teacher observes and documents children’s learning as they are involved in the learning activities. Many outcomes of Kindergarten curriculum are reinforced once daily routines are practiced. This system of organizing the children’s learning experiences can be appropriately contextualized in relation to the social and cultural realities in their community. 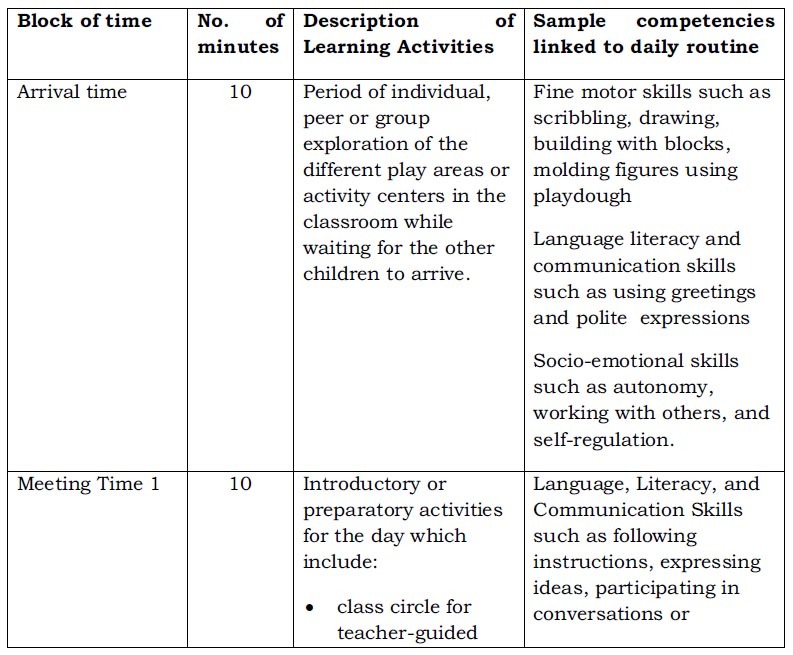 Table 1 outlines an indicative schedule, description of activities, and sample competencies that can be developed in each block of time. A. The Policy Guidelines on Classroom Assessment issued in DepEd Order No. 8, s. 2015 provides the basic direction on how assessment in Kindergarten should be done. It prescribes the use of qualitative or non-numerical grading in measuring the performance, and tracking how a five-year old child learns vis-a-vis the expected learning outcomes. It is important to note that assessment, being integral to the learning and teaching process, must be conducted while learning is happening. Therefore, the best opportunity to assess children is in the natural setting of their daily engagement with classroom activities, and during play. Consequently, assessment requires performance-based tools based on the Kindergarten Curriculum Guide (KCG) that would yield an authentic measurement of the child’s abilities and skills. B. Assessment in Kindergarten should be ongoing and well-planned. Essentially, assessment assists teachers to understand individual strengths and weaknesses, and enables them to design appropriate learning activities to cater to the needs of individual learners. Assessment also leads to identification of possible learning difficulties or disabilities that may require further evaluation, and/or plans for early interventions. i. What is assessed in the classroom? Assessment in the Kindergarten classroom helps teachers to determine if the curriculum standards set for 5-year old Filipino learners have been met. Curriculum standards define what children should know and be able to do under the seven (7) developmental domains. The content and performance standards in the KCG outline what is to be learnt by Kindergarten children. The content standards describe what children are expected to know (knowledge), and the performance standards describe what children should be able to do (processes and skills). Teachers must use the curriculum standards in the KCG to assess children’s learning, behaviors, and attitudes. ii. What is the process of classroom assessment? Classroom assessment is an ongoing process of identifying, gathering, organizing, and interpreting quantitative and qualitative information about what learners know and can do (DO 8, s. 2015). There are two types of classroom assessment, namely, formative and summative. Formative assessment is used to see how best to support learners in their development. On the other hand, summative assessment is used to measure whether learners have met the content and performance standards outlined in the KCG. Both results of formative and summative assessments can be used to evaluate how well the program has been able to meet the needs of the children in the class, help teachers arrive at important decisions regarding future learning, and reflect on their teaching practices. Communication, Mathematics, and Understanding the Physical and Natural Environment. It also offers insights into how children work within a group and manage new and/or more challenging tasks. It also allows teachers to observe the children’s level of engagement and participation in the varied activities provided in class. It is important that the teacher observes both the process and the outcome of a child’s participation in an activity. Teachers may also engage the children in a discussion about their work (i.e., the materials used, the children’s level of effort and attitude while doing the work, as well as the learners’ personal evaluation of their output). Such discussions help both teachers and learners. Learners are given immediate feedback that helps them appreciate what they already know and do well, and enable them to learn more or do better. Meanwhile, teachers gain deeper insights into the students’ understanding of concepts, and their strengths and needs. It will allow teachers to teach their learners better. Formative assessment in Kindergarten starts with the administration of the Philippine Early Childhood Development (ECD) Checklist at the beginning of the school year. The Philippine ECD Checklist is a normed developmental screening tool for three to five year old Filipino children. It has a standard protocol for administration and scoring. It provides significant information about a child’s developmental status, and aids the teacher in detecting possible developmental delays. If the child has undergone early childhood care in public day care centers, a copy of the accomplished Philippine ECD checklist should be obtained from the learner’s parent upon enrollment. The teacher can then validate the accomplished ECD checklist or reassess certain competencies as necessary. However, if the child has no day care experience, the teacher has to administer the Philippine ECD checklist at the beginning of the school year. This initial assessment is important because it enables teachers to establish individual profiles of their learners, and guide the teachers to modify objectives and learning experiences to meet individual needs of children. It also helps teachers determine whether learners may need further assessment or special intervention. For Kindergarten, this form of assessment is conducted at the end of the year, through the administration of the Philippine ECD checklist, and teacher-made assessment tools (i.e., portfolio assessment, and performance-based tasks). At the end of the school year, it is important to determine achievement of competencies across developmental domains as articulated in the KCG. Learners should be assessed for all remaining competencies in the KCG. Evaluation of individual children’s achievement levels and school performance is always based on the combination of both the built-in or informal evaluation, and the more formal and periodic evaluation. In that sense, summative assessment is always cumulative. It is a collection of assessments performed over time. Thus, a single form of assessment is inappropriate. In addition, the nature of the child must be taken into consideration, and that a prolonged assessment session is not advisable. The School Readiness Year-end Assessment (SReYA) Tool will no longer be administered as a year-end summative assessment for Kindergarten. The yearly reproduction of the Philippine ECD checklist Child’s Record Form 2 for every Kindergarten learner shall be incorporated in the Division Educational Development Plan (DEDP). iii. How is assessment information recorded? Teachers need to record evidence of children’s achievement of the competencies across the seven (7) domains that were taught or developed within a quarter. Teachers record evidence of children’s learning through the use of different recording mechanisms such as checklists and portfolios. a. Checklists are used to keep track of and record learners’ competencies such as knowledge, understanding, skills, attitudes and behaviors while the children are learning. Target competencies are listed in logical order, with similar and related items grouped together. Typically, teachers put a check (•/) to indicate the presence and demonstration of behaviors, skills, and concepts mastered, or a cross (x) to indicate an absence of them. Teachers accomplish the checklists based on their day to day observations of the learners as they perform daily activities or assigned tasks in the different blocks of time. Checklists do not have to be completed in the day or week they began but can be completed progressively over a period of time. b. The Philippine ECD checklist is administered twice a year (beginning and end of the year) to evaluate Kindergarten learners’ competencies in different domains. c. A portfolio is a systematic and organized collection of children’s outputs. Teachers must have a compilation of learning evidence for each child. A portfolio is an important tool for monitoring the development of their skills, capabilities, and learning progress over time. Determining what will be included in the portfolio will depend on its purpose. Teachers may choose to organize portfolios to monitor growth of the learners’ knowledge, skills and attitudes in a particular area or domain. Portfolios may also be used to display students’ progress or achievements by showcasing the learners’ work. An assessment portfolio may also include not just students’ work, but also teacher’s assessments, such as individual checklists or anecdotal records, which teachers may use as basis for accomplishing the learners’ progress report. Presentation of the portfolio to parents will be at the end of every quarter during the Parent-Teacher Conference. iv. How is assessment information reported? At the end of every quarter, a progress report will be provided to the parents. Overall performance of the learner based on all the evidence of learning such as portfolios, checklists, and teacher’s observations will be summarized in the progress report. The progress report contains a cluster of representative skills across developmental domains and content areas. Each of the representative skills listed in the progress report is linked to one or more competencies in the Kindergarten Curriculum Guide. Please see Appendix 1 for the progress report items and their links to the CG. Appendix 2 presents a sample template of the Kindergarten progress report that will be released to the parents. Regional and Schools Division Offices shall ensure that the Kinder progress report released by the schools are contextualized in the Mother Tongue. Qualitative ratings shall be used in the progress report instead of numerical grades because these are more appropriate to the age and development of Kindergarten learners. Quarterly parent-teacher conferences are opportune times to discuss with the parents/guardians the learners’ achievements and progress over the course of ten (10) weeks. During these conferences, teachers present the learners’ portfolios to the parents/guardians, and engage them in conversations about the learners’ development and behavior in school, as well as learning goals for the next grading period. Teachers are encouraged to celebrate the significant achievements of their students by giving certificates of recognition or teacher-made ribbons every quarter. At the end of the year, each learner in class shall be recognized for their most evident abilities or positive traits and attitudes. Teachers are also encouraged to engage in discussions with individual learners about their progress and achievements. These discussions should build confidence and motivation in the learner, and should lead to setting of learning goals. v. How are learners promoted or retained at the end of the school year? All learners who complete Kindergarten are promoted to Grade One. However, a learner may be considered for possible retention if he or she has incurred absences of more than 20% of the prescribed number of hours during the school year. In this case, the School Head may, at his or her discretion after looking into the individual’s case, exempt a learner who exceeds the 20% limit for reasons considered valid and acceptable to the school (DepEd Order No. 8, s. 2015). For learners who take part in their community’s socio-cultural activities which also contribute to the development of their cognitive and cultural capacity (e.g., farming and communal mourning practices), the competencies developed during such activities shall be assessed and considered in deciding on the learner’s retention or promotion. A. Learning resources and instructional materials refer to materials that teachers use to help students meet the learning standards. For Kindergarten learners, active interaction with the materials and people in the environment is the key to better learning. Learners use these materials to learn about their relationships with the physical world as they interact with them. Engaging in these materials not only gives fun and enjoyment to children but also helps develop new skills and competence. B. Teachers should refer to the Kindergarten Curriculum Guide to identify the learning standards and competencies that are expected of Kindergarten learners. These standards and competencies should drive teachers’ instructional decisions in the classroom. The Teacher’s Guide is another primary reference for teachers in carrying out the day to day teaching and learning processes. It contains suggested play- and theme-based activities for the different blocks of time per day, within a week and in the span of forty (40) weeks. It should be noted that Kindergarten teachers can modify or revise these suggested plans, activities, and materials depending on his/her assessment of the learners’ instructional needs and socio-cultural context. D. All instructional materials that are provided to Kindergarten learners should be well-chosen, fit for purpose, and safe to use and manipulate. Materials should be stimulating, lightweight, and durable as well. All these instructional materials should be properly organized in the Kindergarten classroom to maximize their utility. Teachers should also take time to introduce how materials should be used and cared for by the learners. A. The school should provide a rich physical learning environment that is open, respectful, caring, nurturing, and safe for the total development of the learners. This includes the wider community setting where the learners’ prior learning has its origins and which has been foundational in honing their learning abilities. Young children learn by doing and active engagement with materials, equipment, people, and places in their learning environment. The organization of the space inside and outside the classroom, including the materials and equipment, sets the expectations for student engagement. The physical environment should anticipate individual, small group, and whole group activities among students, and allow for teacher and student-initiated activities as well. Through these group activities, children learn how to work with others, share, negotiate, resolve conflicts, learn self-advocacy skills, practice decision-making skills, move at their own pace, discover their own areas of interest, and ultimately fully engage in their individual interests and choices. B. Consequently, the classroom arrangement should allow engaging experiences in reading, writing, listening, dramatic play, art, numeracy, and the natural environment. Corresponding areas/space must therefore be provided to encourage learners to spend more time engaging in different learning activities within these areas. The learning environment needs to be set up in such a way that learners are provided with a variety of learning opportunities and challenging experiences that will develop autonomy and competence, and will stimulate their joy in learning. C. As a general rule, the setup of the learning space, which includes the classroom and the play area, should be designed in relation to the socio-cultural and bio-geographical context and realities of the community, since learning and its application happen best in relation to the learners’ actual experiences in the community setting. The durability of materials and structures may also be strongly affected by the bio-geographical environment and local weather patterns and thus, should be considered in choosing a site and in designing and building the classroom. These considerations should be taken into account in relation to the descriptions of the classroom set-up discussed below. a.1 The standard classroom size is 7m x 9m. a.2 All schools must allocate a classroom exclusively for Kindergarten with 1:1 teacher-classroom ratio. a.3 All Kindergarten classrooms must be located on the ground floor, and must be next to the nearest entry and/or exit access points. b.2 The technical specifications of basic school furniture specifically designed for Kindergarten are found in DepEd Order No. 93 s. 2009: Enclosures 4.1 – 4.6.
b.3 The mounting of a clean multifunction blackboard or white board should consider the eye level and reach of the children. b.4 Water, sanitation, and hygiene facilities such as toilet, bathroom, and hand washing facilities must be suitable to the height of Kindergarten children. Installation of the toilet bowl should be such that 5-year old children can sit comfortably on the bowl with both feet touching the floor, and installation of urinal for the boys should be such that 5-year old children can stand comfortably with both feet touching the floor. Water facilities and lavatory should be made available in every classroom. b.5 Proper and adequate lighting (natural and electric lighting), and ventilation for a 7m x 9m classroom, should have at least two (2) 40-watt fluorescent lamps, and one (1) wide window (2010 Educational Facilities Manual). b.6 Emergency equipment and tools should be present inside the classroom (e.g., fire extinguisher, flashlight, and whistle), as well as a medical kit (e.g., bandages, gauze, antiseptic solution, and basic medicines). – mirror, comb, towel, toothbrush, soap, toiletries, nailcutter, tissue paper, etc. – household play items, costumes or dress me up items, etc. To support the development of their physical and motor skills, as well as improve their concentration and attention, Kindergarten learners should have daily access to ample outdoor space with a minimum lot area of 360 square meters. This would allow them to run, walk, climb, jump, hop, skip, slide, creep, crawl, swing, or throw and catch. The outdoor environment should have a balance of sunny and shaded areas, and it should be clean, safe, and well-maintained. Playground equipment such as, but not limited to, balance beam, swing, seesaw, monkey bars, sand and water play equipment, simple obstacles, and slides are recommmended. Appendix 4 lists down the technical specifications of structures and facilities recommended for the outdoor play area. A House and Garden Care area can also be set up with gardening tools (i.e., shovel, spade, pails, sprinklers, cleaning tools, etc.) in a safe area designated for gardening. Appendix 5 presents a sample layout for an outdoor play area. An alternative space for playground is the nearest park or open space not more than 200 meters from the school. This arrangement must be approved in writing by the authorized representative of the park or open space. In cases where outdoor spaces are limited and unsafe, the school must set up an indoor play area to ensure the development of the learners’ physical and motor skills. The organization of Kindergarten class in public schools is prescribed to be at 1:25 teacher-pupil ratio and classroom pupil ratio. In Multigrade schools where the number of enrolment is less, classes should still be organized (Kindergarten class should be conducted separately). A. Schools Division Superintendents must strictly adhere to the policy on the deployment of teacher items, and shall prioritize the hiring of qualified Kindergarten teachers following the guidelines stipulated in DepEd Order Nos. 7 and 22, s. 2015. Kindergarten teachers must be proficient in the Mother Tongue of the learners, and/or the language widely-used in the community where the school is located. Deployment of Kindergarten teachers must take into consideration the medium of teaching and learning used in the schools. Kindergarten teachers must attend the K to 3 Teacher Induction Program organized by the School Head and/or the Schools Division Superintendent (SDS). a. School heads shall organize and monitor Learning Action Cells for all K to 3 teachers as a venue for continuous and cost-effective in-service training and teacher development. Trained Kindergarten teachers are encouraged to initiate and facilitate these collaborative learning sessions with other Kindergarten teachers. b. Kindergarten teachers are encouraged to pursue continuous professional development by attending teacher-training programs, seminars, and/or conferences on areas such as, but not limited to: developmentally appropriate practices, early intervention, child growth and development, early language, literacy, and numeracy (ELLN), Mother Tongue proficiency, and best practices in MTB-MLE implementation. As part of contextualizing the teaching-learning process and strengthening the partnership with the community which is the wider “classroom”/learning space of the learners, learning facilitators from the community (e.g., parents, culture bearers, and knowledge holders) may take part in sessions as appropriate and agreed upon with the community. School heads should facilitate the process of dialogue with the community and based on agreements reached, oversee the proper coordination between the community learning facilitators and Kindergarten teachers in the management of sessions. A. Age qualification for Kindergarten learners in public schools should be five (5) years old by June 1 of every school year (DepEd Order No. 16, s. 2015). However, the school may consider learners entering Kindergarten who will turn five (5) years old by the end of August on the condition that the Philippine Early Childhood Development (ECD) Checklist must be administered to the learner to ensure that the learner is capable of meeting the expectations of the grade level. Parents may provide documentation and/or certification of the learner’s previous Early Childhood Education (ECE) experiences (i.e., preschool, day care, pre-Kindergarten) in addition to the results of the Philippine ECD Checklist. School Heads must then submit a letter stating the learner’s results from the Philippine ECD Checklist and if there are any additional documentation of ECE experiences to the Schools Division Superintendent (SDS), and secure written permission from the SDS for these learners to enter Kindergarten. B. A birth or baptismal certificate is the documentary basis for early registration. Learners without a birth certificate may still enroll, but must submit their birth certificate within the school year (DepEd Order No. 1, s. 2015). The certificate is also the documentary basis for the issuance of the Learner’s Reference Number (LRN) (DepEd Order No. 42, s. 2014). In the absence of a birth certificate during enrolment, the parents or guardian must execute an affidavit of identity of the incoming Kindergarten learner. C. If the child has undergone pre-Kindergarten in Day Care Centers or Child Development Centers, a copy of his or her Philippine ECD checklist must be provided to the Kindergarten teacher. However, the Kindergarten teacher shall still administer the Philippine ECD checklist to validate the child’s developmental abilities during the opening of classes. i. Children who have completed DepEd-accredited Kindergarten programs are eligible for Grade 1.
ii. Children who are six years old and above who have not completed Kindergarten due to difficult circumstances and/or extreme poverty will have to complete the Kindergarten Catch-up Education Program (KCEP). At the end of the KCEP, teachers will have to assess the learners using the Philippine ECD checklist, and report the learner’s performance by accomplishing the Kindergarten Progress Report. These documents will have to be turned over to the learner’s Grade 1 teacher upon enrolment. The results of the assessment will be used by the Grade 1 teacher to design or modify instruction to meet the learner’s specific needs. iii. Children who have completed alternative Kindergarten programs not sanctioned by the Department of Education (i.e. non-DepEd accredited learning centers offering Kindergarten, day care centers offering Kindergarten, home-schooled students) must undergo a validating test administered by the Bureau of Education Assessment in the DepEd Central Office. A representative from BEA may be requested by the SDOs to administer the validating test in their respective SDOs. 16. The Quality Assurance and the School Governance and Operations Divisions at the Region and Schools Division levels respectively are required to conduct monitoring, to provide technical assistance, and to gather best practices and feedback. Regional Offices (ROs) should ascertain that SDOs are in compliance with the herein policy for quality implementation of the Kindergarten Education Program. SDOs should also ascertain that schools are in compliance with provisions in the policy. 17. It is required that monitors, supervisors, and school heads, must have adequate training to ensure professional competence and the required characteristics to be effective monitors, supervisors, and managers of the Kindergarten Education Program. These include the skills in instructional development and management such as mastery of the KCG and knowledge of the recommended pedagogies, and the ability to transmit them during supervision so that teachers flourish in the process of monitoring. Monitoring ranges from daily monitoring of teacher attendance, punctuality, classroom preparation, curriculum implementation, and child-teacher interactions. 18. The Education Facilities Division (EFD) at the Central Office, Region Engineer, Schools Division Engineer, Kindergarten Supervisor/Coordinator, and School Heads should closely monitor the quality of the learning environment. 19. The Teaching and Learning Division (TLD) from the Bureau of Learning Delivery shall continuously monitor and provide technical assistance to the Curriculum and Learning Management Division (CLMD) and to the Curriculum Implementation Division (CID). DepEd Order No. 32, s. 2015, Adopting the Indigenous Peoples Education Currciulum Framework Physical Facilities and Schools’ Engineering Division. (2010). Educational facilities manual: Revised edition of the 2007 handbook on educational facilities – integrating disaster risk reduction in school construction. Pasig: Department of Education Office of Planning Service. UNICEF Philippines, (n.d.). “Early childhood care and development early learning: Providing a right start to learning and to life for all children”. Makati: UNICEF. This policy effective SY 2016-2017 shall remain in force and effect, unless sooner repealed, amended, or rescinded. All prior DepEd Orders, other issuances, or provisions thereof which are inconsistent with this Order are rescinded. do you know a consultant for deped permit processing? for preschool. thanks.